My partner Frank and I were strapped for cash and looking for an affordable way to make it to two weddings in California on back-to-back weekends. 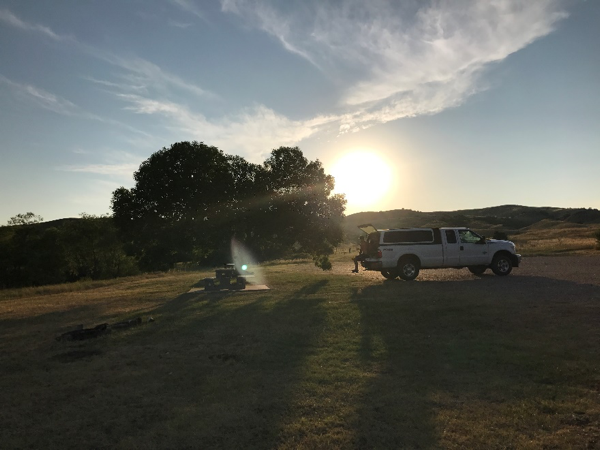 After crunching numbers, he came up with the brilliant idea of meeting me in Minnesota with his truck and setting out to our destinations, while stopping at every national park we could along the way. I figured why not? I was already planning on quitting my job and moving cross country in August, so a month-long trip through the National Parks didn’t seem like a bad idea. If we were going to drive all that way, we may as well enjoy it. 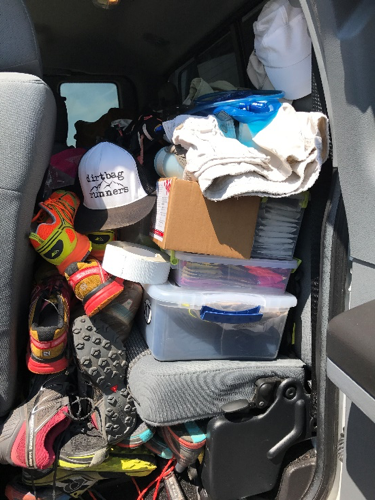 He met me in Minnesota with a truck packed full of gear and goodies for our adventures. I think the shoes alone took up half of the backseat. His of course, not mine. After I turned in the keys to my apartment, we set off to our first destination: Badlands National Park. Side note: If you are planning on doing a similar type of trip, buy an America the Beautiful pass at the first park you visit. It costs $80, but will save you plenty on entrance fees if you visit more than one park. The Badlands alone costs $30 for a seven-day pass. We ended up visiting five parks on our trip. Fast forward to our first night. We ended up finding a free campsite on FreeCampsites.net. The site was about one hour away from the Badlands, which we figured wasn’t bad. We actually lucked out since our waterside site had no mosquitos. The weather, however, was hot and humid. I woke up at midnight and pitched the tent outside of the truck so we could sleep with a breeze. If you’re dirtbagging in the dead of summer, consider a taking a tent. 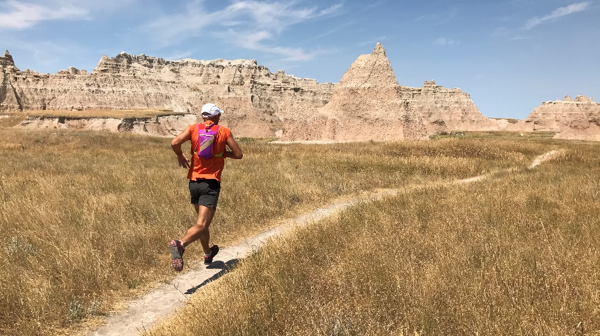 We set out the next day to Badlands National Park with the intention of running a 10-mile out-and-back on the Castle Trail, with room for a few add-ons. We each filled a 70-ounce bladder and carried a 20-ounce bottle filled with drink mix. Since we were on vacation, we decided not to set alarms and wake up when we felt like it. This was a terrible strategy. We didn’t end up hitting the trail until one in the afternoon, when the temperature had already climbed to 95 degrees. 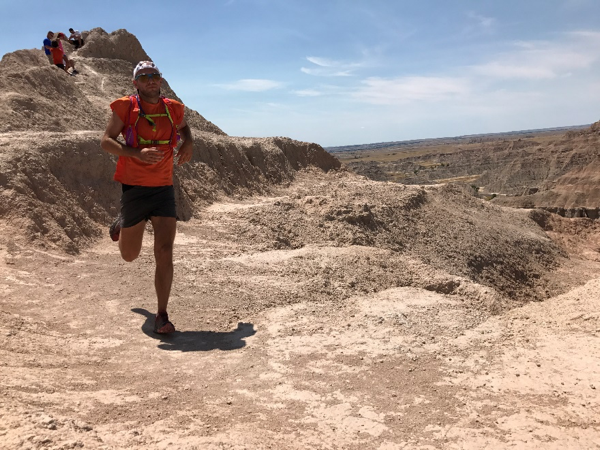 If you tackle the Badlands in the summer, hit the trails in the morning or the evening to avoid the midday heat. Temperatures regularly climb above 90 degrees. Water is scarce or non-existent except at trailheads. We did approximately zero research due to my impulsive nature and decided to wing it. Needless to say, the route ended up being a slog. A beautiful slog, I might add. Despite the scorching heat, the scenery was otherworldly. We discussed the prospect of filming a Mars video on location until we realized neither of us knows anything about using a video camera or filming things. Ultimately, we settled for awesome photos of our adventures instead. A few miles in, I realized that eating wasn’t going to be an option in the heat. I was grateful for the Tailwind, as I could at least replace some electrolytes. Due to the heat, I ended up taking salt tablets every 30 minutes to keep swelling down. We were sweating badly. We turned around four miles into the trail to avoid the risk of running out of water. I had already sucked down ¾ of my bladder. On our way back, we slowed down a bit and took a few more photos. We agreed to check the weather before heading out on our next adventure and plan our run accordingly. 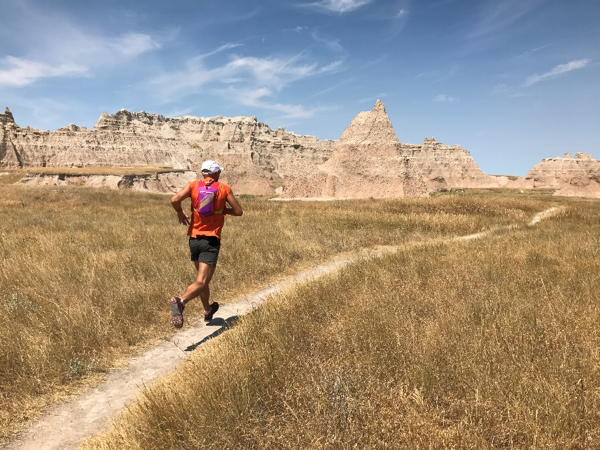 The Badlands offers free backcountry camping if you’re interested in staying in the park for a few days on a budget. Unfortunately, there is little to no water available in the park and fires are not permitted. Plan accordingly. If you’ve got a little bit of extra cash on hand and are interested in a more luxurious experience, check out one of the paid campsites or resorts near the park’s entrance. Plan your groceries and food ahead of time. The convenience store in the park itself is expensive and the nearest location to get extra stuff is in Wall, South Dakota, about an hour away from the interior entrance. Ultimately, the best times to visit the park are in September and October when the weather cools off a bit. I recommend checking it out in late Spring too when the flowers are in bloom – it makes for a completely different experience. Looking for a quick stopover? Several short trails, less than one mile each, showcase a number of the park’s features in a much shorter time frame. If you’re really pressed for time, take a drive on the Badlands Loop through the park to view some neat features without making a huge dent in your trip time. The pull-off areas are usually crowded with other tourists. For additional park information, check out the National Park Service’s Badlands website.